Time flies when you're having fun and our Roxy teams have been doing just that! Roxy Therapy Dogs' 14th school year is well underway, supporting students in Central Bucks School District. Teams are in 138 classes, in 14 elementary schools, an increase of 9% from last year, and we have 4 classes on a waiting list that we are enthusiastically trying to fill. Over 3,300 students are visited each week! In addition to the elementary schools, Roxy continues to support the high schools, Doylestown Hospital, Pedia Manor and the Bucks County Court House for existing programs as well as new programs as requested. To continue reading the complete report, visit President's News For December 2018. 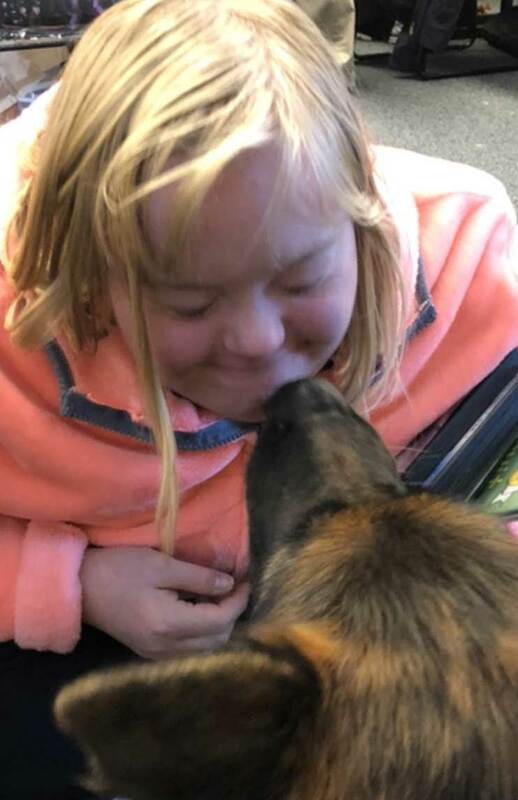 The students at Central Bucks East High School have formed the first ever Roxy Therapy Dogs Club in an effort to give back to, and spread awareness about, the organization that has been a part of their school experience since they were just learning to read! Led by CB East sophomore, and Roxy Associate Director of Volunteers, Maddi Fleck (center), the club's purpose is to organize community fundraisers benefiting Roxy Therapy Dogs, educate others in the community about our organization and the programs we have in place, and also plan activities at school that give the students the opportunity to interact with their beloved Roxy Therapy Dogs (think stress relief around finals!). The club already has a presence on social media and many students have expressed interest in joining. We at Roxy are so excited to see students taking this initiative and are truly grateful for their desire to "give back" to Roxy Therapy Dogs. Roxy would like to extend a very special Thank You to Antheil Maslow & MacMinn, LLP for their generous sponsorship of the printing of its annual appeal. Thanks to Roxy board member, Tom Donnelly, for coordinating this donation from his firm. Roxy Therapy Dogs was thrilled to learn that for the second time in 2 years, Bucks County Foundation has given Roxy a $4,000 operating grant. The mission of the Bucks County Foundation is to enhance the quality of life for residents of the county by stimulating philanthropic opportunity and developing long-term financial assets to meet a wide range of the community’s charitable needs. Deanna Blanchard, MD (center), the newest Bucks County Foundation board member, recently met with Roxy Therapy Dogs President Sharon Fleck (right), Roxy Therapy Dogs Director of Community Engagement Patricia Morrison (left), and Juma, a Roxy therapy dog for almost 4 years, to commemorate the wonderful relationship between the two organizations. Thank You, Bucks County Foundation! To view the full press release, visit Bucks County Foundation Press Release. Book lovers of all ages flocked to the Doylestown Library on November 10 for the annual Bucks County Author Expo. Roxy was on hand with plenty of copies of its children's book, Be Like Bud, plenty of dogs to "pawtograph" copies and provide lots of canine love. The Bucks County Author Expo showcases local authors across all genres and gives the community a chance to meet the authors and pick up copies of their work. Roxy volunteers greeted lots of new friends and had visits from many of the students the teams visit in CBSD elementary schools. A great time was had by all and we are looking forward to next year's event. Thanks to all who stopped by to see Roxy! On November 18, Roxy Therapy Dogs had a fun time at the Shops at South held at Central Bucks South High School. This is an annual fundraiser for the band and included dozens of different craft vendors. It was a great way to start off holiday shopping! People stopped to meet the Roxy volunteers, 2-legged and 4-legged! Roxy's Be Like Budbook was available for gift shoppers to get "pawtographed"! Thanks go out to everyone who stopped by to say HI and to all of our volunteers who made this another fun event in the community. Click on the event name above for specific event details or visit Events. This month we mourn the loss of three faithful friends who comforted countless children in the Central Bucks School District and Bucks County Courthouse. Zoe was a 14 year old Vizsla who had many talents including a master level achievement in agility trials, "saying her prayers" on command, and spreading love wherever she went. She will be missed. To read a tribute from her owner, Sandy, visit In Memory of Zoe. Tigger was the first Pit Bull with Roxy Therapy Dogs. He was a gentle soul who didn't walk, but "pranced" around. He so loved volunteering with Roxy that he would jump up and down in excitement when it was time to go to "work". To read a tribute from his owner, Julie, visit In Memory of Tigger. Cooper was one of the original Roxy dogs. We are tremendously grateful for his years of service and will certainly miss him. To read a tribute from his handler, Connie, please visit In Memory of Cooper. Looking For Holiday Shopping Ideas? Roxy Therapy Dogs has some great ideas for presents, for young and old(er) dog lovers! To stay warm this winter, there are long sleeve tees, comfy flannel pants, fuzzy fleece pullover and zip hoodies, a variety of hats, coffee or cocoa mugs, and a mountain lodge blanket. Your purchase also helps Roxy directly as Stitch N' Witch Embroidery donates 15% from every order to Roxy Therapy Dogs. To learn more about the apparel, gifts and goodies, visit Gear and Gifts. enjoy a great, fun book while staying warm inside. Whether reading with a little one, to your pup, or by yourself, Be Like Bud has so many heart warming stories and photos to enjoy. Be Like Bud makes a great holiday gift, stocking stuffer, or birthday present to be enjoyed during these cold winter months. Your donation helps so many children in CBSD schools, Doylestown Hospital, Pedia Manor homes, and the courthouse. If any dog lovers, young or young at heart, will be visiting this holiday season, read with them from Be Like Bud. Available online today! Check out our new Be Like Bud holiday video too! Roxy™ Therapy Dogs' programs provide an irreplaceable and dependable support system for children in our community. Make a tax-deductible donation online today! If you prefer to donate by check, please make it out to "Roxy Therapy Dogs" and mail to: P.O. Box 136, Danboro, PA 18916. © 2018 Roxy Therapy Dogs. All rights reserved.